Margaret loves belly dancing – she had her first lesson at the age of twelve! Her primary teacher is Donna Barbrick Carlton of International Dance Discovery fame with whom she studied for 10 years. She was also honored to have performed with Donna’s troupe, Banat Mara. She first studied American Tribal Style® with Angie Dinataman. She has taken workshops with talented teachers including Rachel Brice, Asharah, Ruby Jazayre, Shakira, Hipnotic, Jim Boz, Eiko Kocher, Valizan, Blue Lotus Tribe, Megha Gavin, and Carolena Nericcio. She also practices to many belly dance DVDs. In 2005 then troupe member Molly looked at Margaret and said “I wish we could bring Carolena to Bloomington.” Margaret looked at Molly and said “Ok.” This began a joyous partnership with the Bloomington Area Arts Council (BAAC) that brought Carolena Nericcio and Megha Gavin’s Tribal:Pura to Bloomington twice. In 2010, Margaret took over organizing events with Carolena Nericcio and Megha Gavin, bringing – General Skills for ATS® and Tribal Village – 2012 – to Bloomington. In 2012, Margaret received her Teacher Training in ATS® certificate from Carolena Nericcio. Margaret also collaborated with the BAAC in presenting Bloomington Belly Dances and in 2012, began producing it on her own. She enjoys showcasing the belly dance talent in Bloomington and south central Indiana. She also grateful that the BAAC, Iron Kitten Productions, and now A.S.H. have helped and help her with the event. In 2016, Bloomington Belly Dances moved and is now Nashville Indiana Shimmy & Shake in the Brown County Playhouse! This marks a new beginning in area belly dance performance. Different Drummer Belly Dancers has been the belly dance troupe at Gen Con Indy since 2004. Thanks to former troupe member Heather for the idea! Check out the DDBD Gen Con Webpage. When not dancing, Margaret teaches computer applications for the Department of Kinesiology at IU. She lives with her beloved husband Scott, surrounded by beautiful trees that are filled with birds, squirrels, chipmunks, skunk, foxes, and even deer. At least two generations of adorable possums named Sweetpea visit every now and then. In October 2016, Margaret and Scott adopted a rescue poodle named Daisy. They are both crazy in love with her (for obvious reasons as you can tell from her picture). Margaret spends her recreational time with friends and family reading, writing social media posts, watching TV and movies, and gaming. Her favorite times are spent with her husband in her home on their favorite couch. 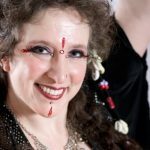 Margaret has taught belly dance at studios around Bloomington including Panache Dance, Windfall Dance Studio, and now at Bloomington Stitchery. She also teaches workshops at Gen Con in Indianapolis. Margaret is thrilled that her troupe, Different Drummer Belly Dancers turned 10 years old in 2013 – 15 years in 2018! Visit the troupe Website: http://www.ddbd.org for all information about DDBD. You can also find the troupe on Facebook, Twitter, and of course YouTube.